And that's good news for guy readers! I was a BIG fan of the first book, The Case of the Case of Mistaken Identity, written by Mac Barnett with terrific illustrations by Adam Rex. (see my review here) So I was very excited to hear about The Ghostwriter Secret, the second one! Steve Brixton has read and reread and reread all 58 of the Bailey Brothers mysteries. He's such a fan that, when he finds himself in the middle of a real mystery, he tries to do what the Bailey Brothers would have done. Now he has set up his own detective agency. In fact, he gets a case right away-a chance to track down the missing Fairchild diamond. But in the middle of it, he gets a letter from MacArthur Bart, the author of the Bailey Brothers mysteries, saying that he's in trouble and needs Steve's help! Can Steve and his best chum Dana rescue the missing author? Who has torn up Steve's crime lab? Why do they leave a note telling them to stay away from MacArthur Bart? And just what is a solar plexus anyway?? You won't know if you don't read this book!! I liked this one a lot. Did I like it as much as the first one? Well, yes and no. This one was a much better mystery. I figured out the first one long before the end and The Ghostwriter Secret had plenty of surprises. This one did not have all the outrageous action and humor of the first one but, to be fair, it would have been very hard to match the first one. After all, that one had librarians who knew 7 kinds of martial arts, Steve being chased by a bookmobile and escaping from the locked hold of a Chinese freighter! But this one also has plenty of action and humor and I'd recommend it to any guy reader out there. Now the BIG question is--will there be another Brixton Brothers book?? You'll just have to read this one to find out!!!!!!! HAPPY NEW YEAR, all you rollin' rockin', readin' guys out there! 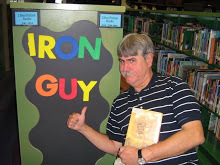 This is about a week late, but the Iron Guy has been busy lately, reading good books for guys and coming up with New Year's resolutions. (More about that next week!) But right now I want to talk about a good book for times like these. 2010 was a rough year for a lot of people--including the library. Everyone hopes 2011 will be better but, even so, it could be a year in which we need a lot of inspiration. So what better way to start off this year with a review of a good and inspiring book? That would be Heart of a Student Athlete: All-Pro Advice for Competitors and Their Families by Karl Mecklenburg. I enjoyed this book. The advice is solid and the stories are interesting. The book isn't perfect; there were a couple of places when he talked about some of his games and I had trouble understanding what happened. But these are minor flaws in a really good book. (Besides, I got this book as an advanced reading copy--which means that a very nice publisher sent it to me before the book came out--and those flaws may have been corrected) If you're into football, if you're not into football, or if you're a guy trying to figure out what life is about, this book is very much worth your time. PS--Since Charlotte is in Mecklenburg county, how could I not like a book by Karl Mecklenburg!